Arriving about 15 minutes before the session began, Pope Francis welcomed to the synod hall the members, delegates from other Christian communities and the men and women who will serve as experts and observers. Synod members must be faithful to church teaching, “the deposit of faith, which is not a museum to be visited or even simply preserved, but is a living spring from which the church drinks to quench the thirst and enlighten” people, he said. 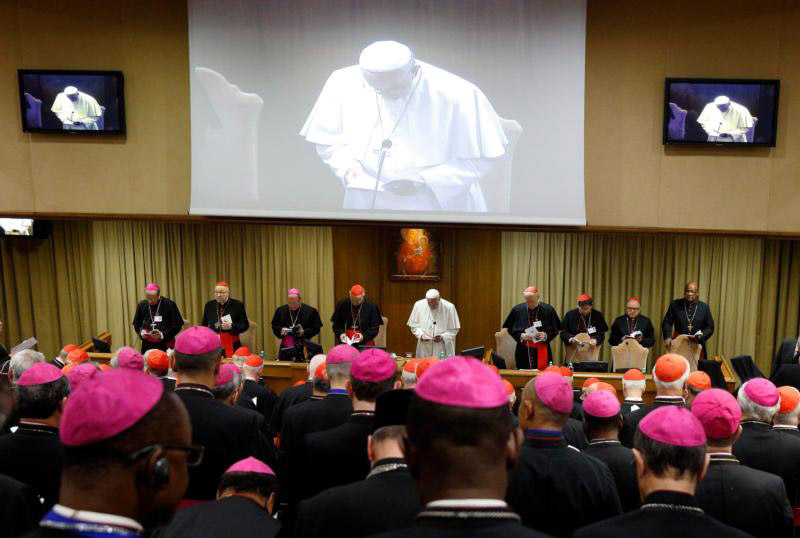 Synod members need “an apostolic courage that does not allow itself to be afraid in the face of the seductions of the world” that are attempting “to extinguish in human hearts the light of truth” and replace it with “little and temporary lights,” he said. The synod, he said, is not a place “to mourn or lament” the challenges families face, but to rejoice and seek perfection and to help families do the same. Hungarian Cardinal Peter Erdo of Esztergom-Budapest, chosen by the pope to introduce the discussion, spoke for close to an hour, outlining the questions the synod will be called to discuss over the course of three weeks. The gathering is set to conclude with a Mass Oct. 25. Looking at the situation of families around the world, he said, one of the primary challenges is economic. Too many families do not have food, shelter or employment. Young people delay marriage and parenthood because they do not have or think they do not have the means to support a family. Millions of families are torn apart by war and migration. In addition, the cardinal said, with an exultation of individualism there is a widespread distrust of institutions — including of the church, the state and the institution of marriage. The Catholic Church at every level, he said, must affirm the missionary role of families, ensuring married couples are part of marriage preparation programs, family support groups and outreach to families in crisis emotionally or economically. Turning to the widely debated topic of the pastoral care of divorced and civilly remarried Catholics, Cardinal Erdo said pastors must be ready to help couples verify whether or not their church marriage was valid. If it was a valid marriage, he said, it is indissoluble, as Jesus himself taught. “The mercy of God offers pardon to the sinner, but requires conversion,” Cardinal Erdo said. If it is impossible for a person to return to his or her spouse, then the church requires that in the new union the partners refrain from sexual relations. “It is not the failure of the first marriage, but living together in a second relationship that impedes access to the Eucharist,” he said. Cardinal Erdo said the synod would be called to examine more carefully the idea of offering a “penitential path” to such couples, a path that would lead to their receiving absolution and having access to the Eucharist, perhaps gradually. But, he said, his opinion was that such a path necessarily would require a promise of sexual abstinence. Responding to reporters later, Cardinal Erdo said his report’s affirmation of the indissolubility of marriage and moving away from seeking a pastoral approach to allowing those couples to receive Communion were the result of the input the synod sought from Catholics around the world after the extraordinary synod on the family last year.